Now that you have the Tal’dorei Campaign Setting in your hands, what can you do with it? Play games, of course. But what adventures? Wizards has released a number of adventure books since 5th edition launched, and some of them are easy to integrate into Exandria. Caution: Spoilers for Out of the Abyss are contained beyond this point. If you wish to play as a player, stop reading here. You have been warned! One of the Adventure books that Wizards has released for 5th Edition D&D is called Out of the Abyss. It was primarily written by Green Ronin, on behalf of Wizards. 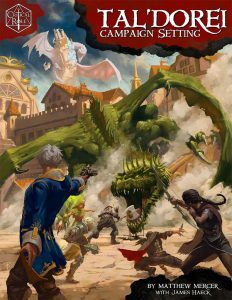 The adventure, as written, is set in the Forgotten Realms, but it takes place mostly in the Underdark, and so requires very little massaging to use it in Tal’dorei. You may wish to change the names of some of the cities of the underdark. I don’t think it will really matter much for most of them, although many of them have been in use in the Forgotten Realms for many years. There is a rough map on page 19 of the adventure that shows approximate locations of the underdark cites in relation to the overland Forgotten Realms map. You probably don’t need to change this, as the facing page has approximate travel times between the various locations. It’s probably best to use that as a rough guide for travel. The largest change needed in the book is Chapter 8. The first thing to do is replace Bruenor Battlehammer and Gauntlgrym with Gradim Greyspine and Kraghammer. Then, replace the various Forgotten Realms specific factions (The Harpers, The Lords’ Alliance, The Zhentarim, The Emerald Enclave, and The Order of the Gauntlet) with Tal’dorei specific ones. (I’d suggest The Arcana Pansophical, The Ashari, The Council of Tal’dorei, The Chamber of Whitestone, and The Clasp.) Special note: In the adventure, the Zhentarim have a trading outpost in an underdark city. Have one of the factions that you replace the Zhents with (perhaps the Clasp?) have a similar outpost. Dawnbringer appears as a golden longsword hilt. When it’s attuned and held in your hand, you can use a bonus action to activate it, causing a glowing blade to appear. Dawnbringer functions as a longsword with the finesse property. You have a +1 bonus to attack and damage rolls with this weapon. It deals radiant damage instead of slashing damage. When you hit an undead or demonic target with it, it deals an extra 1d6 radiant damage. Sentience/Personality: See the adventure, page 222. Increase the bonus to attack and damage rolls to +2. Increase the bonus to attack and damage rolls to +3. Tune in next time for a more in-depth conversion, Princes of the Apocalypse! 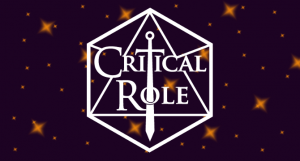 We wanted to give you an update on the shipping of pre-orders for the Critical Role: Tal’Dorei Campaign Setting. This is the biggest pre-order we’ve ever had by far. It’s a large and complicated job, so we are using an outside fulfillment company for shipping. This has led to some minor issues that had to be ironed out with our store software and their fulfillment software not being 100% in sync. That got sorted out and shipping began. If you pre-ordered, there’s no need to worry. Shipping is ongoing and you will get your books. We had said on Twitter that you’d get a confirmation email when your order shipped. Due to the software issue I mentioned above, however, that is actually not the case. We will get tracking info from the shipping company when they have finished the job, but by that point most of you will have your books anyway. The best thing to do is just hang on while the job is processed. You will be seeing your books soon.